This is a Sponsored post written by me on behalf of Tyson® Foods, Inc. All opinions are entirely my own. Believe it or not, Mother’s Day is already next month! It seems as if the Spring time is flying by but the warmer weather did not get the memo here in New England. I cannot wait for fresh flowers, lots of sunshine, and days spent outdoors. I want to be able to enjoy my days with my family, and especially mom. We love to yard sale with the warmer weather and go on little adventures. 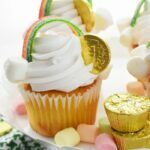 With Mother’s Day around the corner, many of you might be wondering what you should get, or make for your mom. We love homemade and sentimental items for our mom. Fresh baked cookies, cakes, and brunch are some of her favorite gifts. She just loves her cheesecake and her weakness; Sausage, Egg, & Cheese Breakfast Sandwiches. In fact, my mom spends a pretty penny every morning on her coffee and breakfast sandwiches. That is why I wanted to make her, her very own Mother’s Day Brunch. 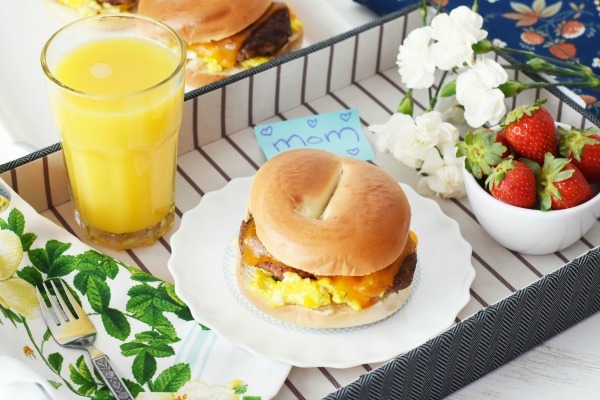 Every mom deserves breakfast in bed or a tasty brunch on Mother’s Day. When my kids asked me what I wanted I asked for breakfast in bed, and something homemade. I have never actually enjoyed breakfast in bed, so it should be a fun experience. They know I love sausage, eggs, toast, and bagels- who doesn’t love bagels? I guess you could say I get my taste buds from my mom because I also love sausage, egg, and cheese bagel sandwiches. That is why I decided I will surprise her with some on Mother’s Day. 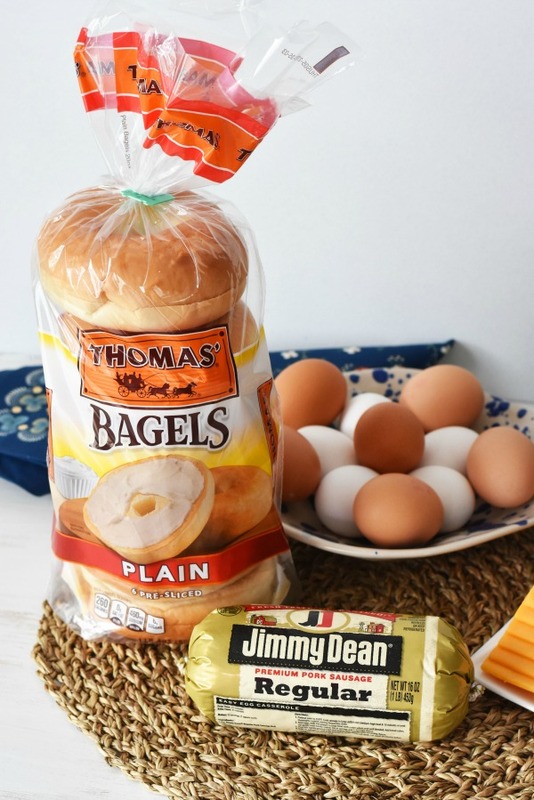 For a really tasty breakfast sandwich you need to start with some tasty ingredients like Jimmy Dean® sausage, and Thomas’ Bagels®. These two brands make breakfast foods that are delicious and easy to find at your local Walmart store. On a recent trip to Walmart, I picked up some Jimmy Dean Regular Premium Pork Sausage, some Thomas’ Pre-sliced Bagels and some other brunch ingredients. 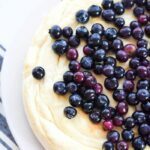 I wanted to make a trial run of this brunch recipe idea to make sure it was as tasty as I envisioned it to be. I decided to make some Sausage, Egg, & Cheese Breakfast Sandwiches. 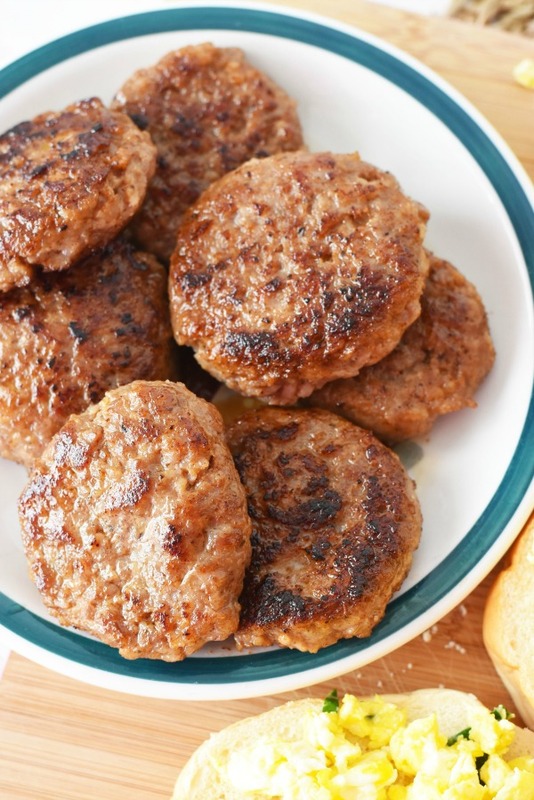 Slice your Jimmy Dean Regular Premium Pork Sausage into six even slices. Reform into patties with a slight center depression to keep them from seizing up into balls. 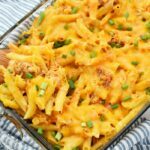 Cook over medium-high heat until fully cooked. Scramble your eggs with salt & pepper and parsley until done. 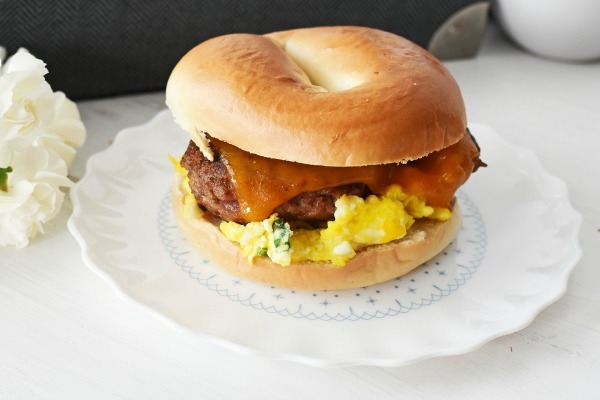 Layer bagel with scrambled eggs, one sausage patty, and cheese. Heat bagel in a 250-degree oven until cheese is melty. ***Additionally, you can also serve each of these ingredients separately for a fun breakfast in bed experience for your mom. I made a trial run and think it came out really cute. Tyson Loves Mom and wants to give back this Mother’s Day! Head over to tysonlovesmom.com sweepstakes page where you could win 1/5 $200 Walmart Gift Cards! What is your favorite way to show your mom how much you care? Awww yeah. That’s the kind of breakfast I live for! That’s a handful of awesome! 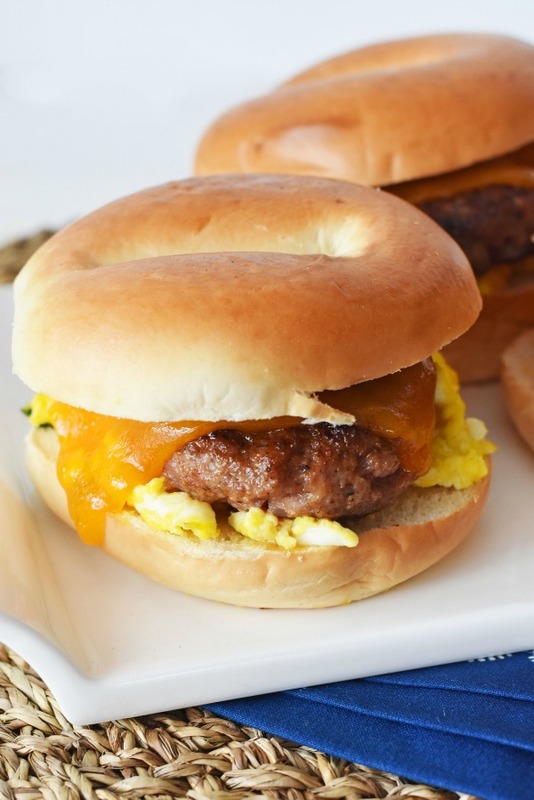 I love a good Sausage, Egg, & Cheese Breakfast Sandwich. Thomas makes great bagels and I’m a fan of Jimmy Dean’s sausage. I love Jimmy Dean sausage and it is one of the only two brands of sausage I’ll buy. And sometimes I’m nice enough to share it with the rest of the family. Mother’s Day might be another story, though! I would love to be served breakfast in bed. I’m sure my daughter could handle that quite well. I will have to drop a hint. These breakfast sandwiches look so delicious. 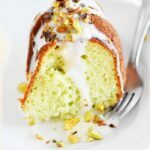 I am sure they will be a hit in my house. My Mom and I like to go to the Spa together. I know, I can’t believe Mother’s Day is just around the corner too. 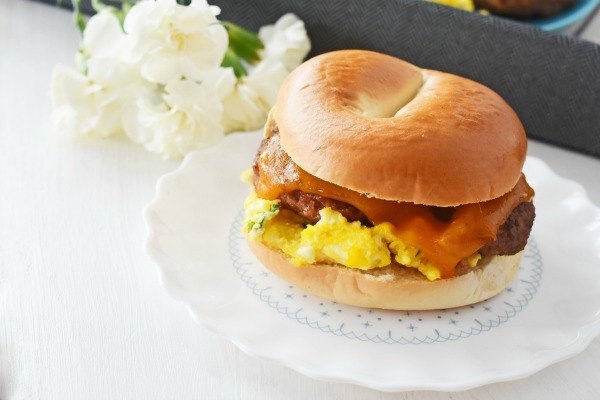 Your breakfast sandwich idea using bagels looks absolutely delicious and easy enough for kids who are old enough to cook to make for Moms this Mother’s Day. Those look so delicious. I make something very similar to these. I love them! This looks so much tastier than buying one from a drive-thru. 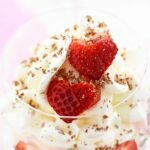 I would eat this any day, not just on Mother’s Day! That right there would go over very well in my house for breakfast! I love the Thomas’ bagels! Absolutely lovely. Great idea for me to make for the Wifey. Breakfast is my favorite meal of the day. This sandwich looks great!